Time for snack? Looking for a quick and delicious meal? Chocolate Caramel Pretzel Krispie Treats is just what you need.. Delicious brunch recipe perfect for busy days..
Crunchy crispy rice and pretzels combined with melted marshmallow and caramel sauce, coated in chocolate… mmmm yummy… I really love this quick and easy combination. 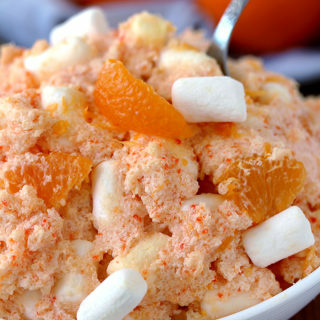 It takes only 10 minutes to make this delicious snack and your kids will love it. 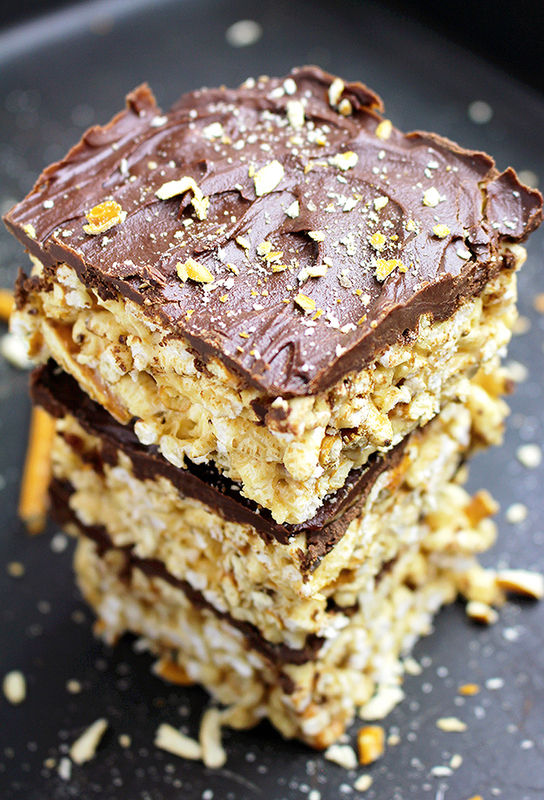 My son is always happy when I make Chocolate Caramel Pretzel Crispy Rice Treats for snack. Take a look the rest of our pretzel and treats recipes Caramel Pretzel Cheesecake Ice Cream and Marshmallow Rice Crispy Almond Treats. 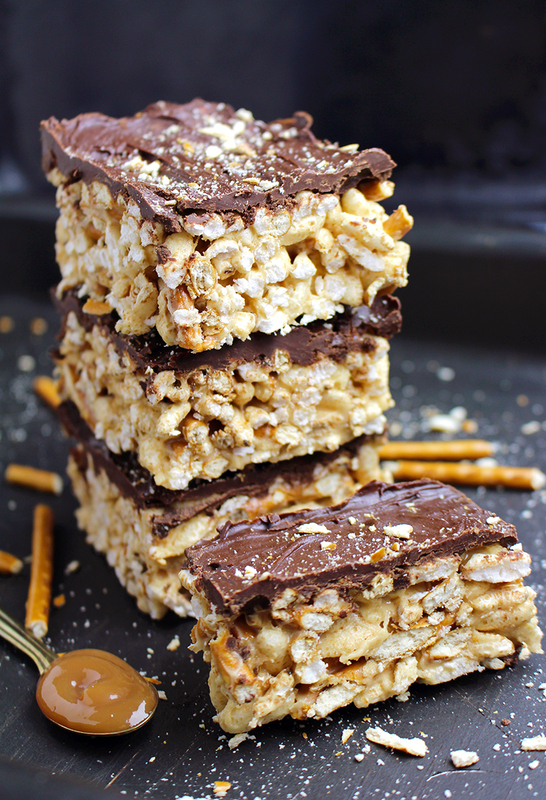 What do you need to make this Chocolate Caramel Pretzel Krispie Treats? 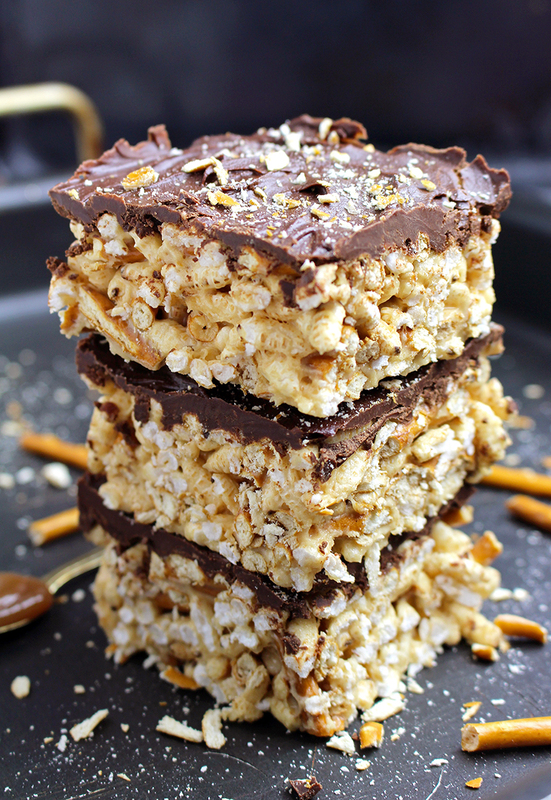 I simply adore snack time, it is my moment of peace and time to relax.While I am reading newspapers or watching TV I really enjoy delicious treats, so Chocolate Caramel Pretzel Crispy Rice Treats is often on our menu. How to make Chocolate Caramel Pretzel Krispie Treats? Put parchment paper in an 8×8 inch pan and set aside. Put unsalted butter, caramel sauce and marshmallow in a large pan, stir at a medium heat for about 5 minutes, until it melts. Remove from heat. Add vanilla extract, crispy rice and pretzels and mix well. Spread the mixture evenly in the baking pan. Using a firm object, or your hands, shape the mixture well. 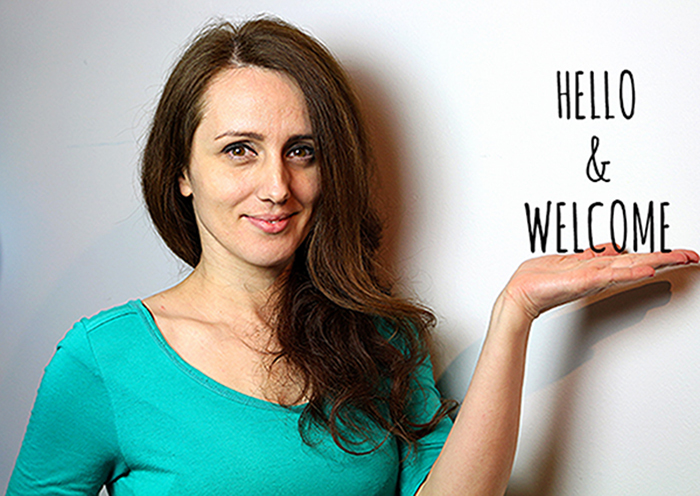 You might even want to oil your hands, if the mixture is sticky. Leave it to cool. Meanwhile, prepare chocolate frosting. 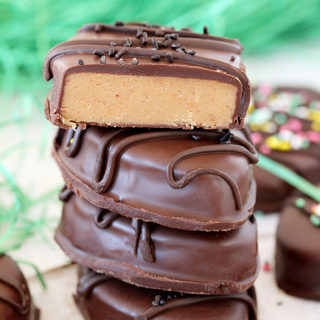 Put pieces of chocolate in a smaller pan. Pour some water in a larger pan. Put smaller pan on the larger one (it mustn’t touch the bottom) and melt the chocolate,at a medium heat, stirring from time to time. Leave it to cool for a minute or two and spread over the Crispy Rice Treats. Is it a Twix? No. Is it a Snickers? No. 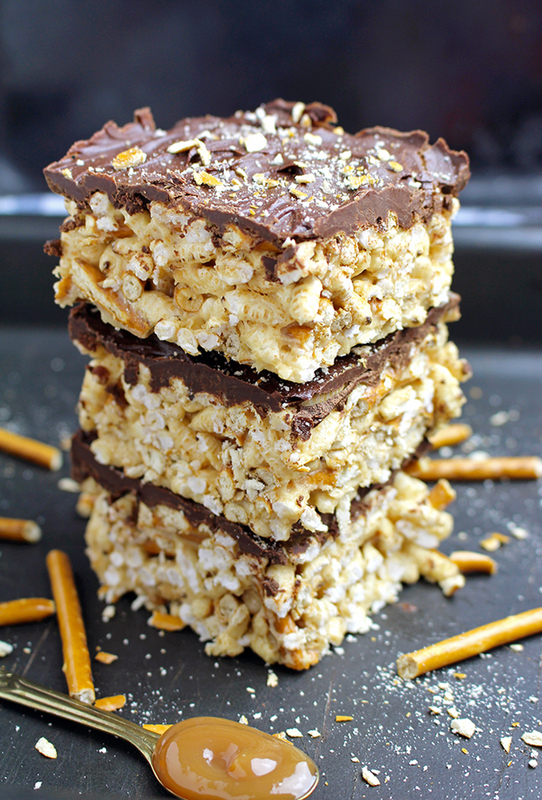 It`s a Chocolate Caramel Pretzel Krispie Treats. Sweet – salty, crunchy, yet juicy combination is how I see this treat. Try it and enjoy! Sweet – salty, crunchy, yet juicy combination is how I see this treat. 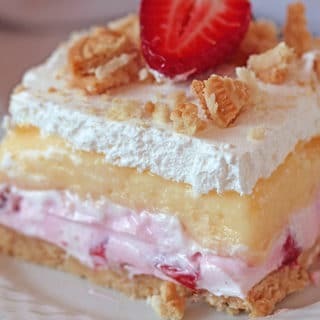 Try to make this and enjoy! Put parchment paper in an 8x8 inch pan and set aside. Put smaller pan on the larger one (it mustn't touch the bottom) and melt the chocolate,at a medium heat, stirring from time to time. Leave it to cool for about an hour, then cut into squares. Enjoy!